Mechanism of action discovered for naturally occurring compounds and new chemical entities by combining knockout mice and bioinformatics approaches. Diabetes mellitus type II is a chronic disease that is distinguished by insulin resistance and hyperglycemia (high concentrations of glucose in the blood) due to cells in the body not uptaking glucose. Type II is a rapidly growing condition common in developed countries. Currently over 29 million Americans are diagnosed with Type II and out of all the cases of diabetes, Type II consists of 90% of the cases. Obesity, lifestyle, genetics, and previous medical conditions are the leading risk factors to Type II. At NIMML we utilize animal models in order to simulate the proliferation of diabetic symptoms under conditions where potential biomolecular targets of medical interest can be manipulated and observed. In order to study these possible therapeutic targets and Type II NIMML has utilized the following mouse models. Cg-+Leprdb/+Leprdb/OlaHsd (db/db) strain mice are a model of obesity and diabetes caused by a deficiency in leptin receptor activity through gene knockdown. Due to this leptin deficiency, it causes the mice to become hyperphagic, obese and hyperglycemic. Obesity can be seen in mice after 5 weeks of age, followed quickly by hyperglycemia. The db/db mouse model insures quality genetically induced conditions in which diabetes symptoms can be accurately simulated. C57BL/6J strain mice are fed a high fat isocaloric and isonitrogenous AIN-93G diet where calories obtained from fat are increased substantially (16% more kcal from fat). Obesity from the diet drives insulin resistance over time. 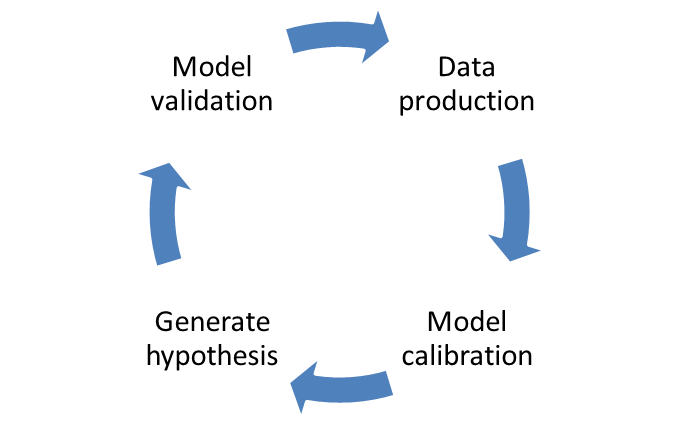 As this model is induced by an environmental manipulation rather than genetic, it may be considered more accurately representing the common human condition. C57BL/6J strain mice were fed purified isocaloric and isonitrogenous diets that represented a low fat modification of the AIN-93G diet commonly used for the growth, pregnancy, and lactation phases of mice. Activation of PPAR gamma and alpha by punicic acid ameliorates glucose tolerance and suppresses obesity-related inflammation. Catalpic acid decreases abdominal fat deposition, improves glucose homeostasis and upregulates PPAR alpha expression in adipose tissue. Dietary abscisic acid ameliorates glucose tolerance and obesity-related inflammation in db/db mice fed high-fat diets. Mouse model of C. difficile infection creates colonic inflammation and symptoms of gastrointestinal disease. C. difficile experiments within NIMML follow a standard timeline of events. As mice are resistant to C. difficile infection with an intact intestinal flora, five days prior to infection with C. difficile (termed day -5), an antibiotic mixture (colistin, gentamycin, metronidazole, and vancomycin) is added to the water supply. Mice stay on the antibiotic water until day -3 of the timeline at which point mice will be placed back on standard water. On day -1, mice receive an intraperitoneal injection of clindamycin (32 mg/kg) to further remove any colonizing species. On day zero, mice are challenged with C. difficile through intragastric gavage. The strain VPI10463 is used for our studies. The model provides the opportunity to analyze an acute infection (through day 14) and a relapse period (through day 30). The mouse model of C. difficile is able to be used to study a broad range of C. difficile related factors from the role of the microbiota to the balance of T cells to the activation of neutrophils to the formation of lesions. While the model requires the use of antibiotics to induce disease, the need for a reduced microbiota is not unlike the development of disease within humans, as most C. difficile infections are associated with antibiotic use. The model also provides the ability to study multiple events throughout the progression of disease from the initial colonization and response in early disease in days 1 through 3 and the peak of inflammation and disease on days 4 and 5 as well as the recovery phase and clearance of infection between days 8 and 10. Previously, we have utilized this model to establish systems level computational models of the host response to C. difficile, investigate the role of miRNA in the establishment of inflammation, and evaluate natural products for therapeutic efficacy. The NIMML pre-clinical studies have an added translational value by the incorporation of pig models of infectious and immune-mediated diseases, including inflammatory bowel disease (IBD) and infections caused by enteric or respiratory pathogens. As opposed to mice, pigs lend a physiological composition more comparable to humans, specifically the mucosal immune system, of the pig more closely resembles that of human and are thus an ideal model for studying the complexity of the human immune system and how it responds to inflammation, infection, and injury. Preclinical studies using pigs lay the groundwork for an informed design of human clinical trials. Our AAALAC-accredited swine facility consists of 16 separate experimental housing rooms with capacities of 8 pigs each. A fully equipped surgical room is located in the building for onsite collection of specimens. Supervisors, students and animal technicians are able to provide superior husbandry for pigs spanning all ages of the life cycle. The majority of our projects use neonatal to weaned pigs. Gnobiotic swine litters are also available. Procedures routinely performed in the swine studies include venipuncture, injections, immunizations, and intubation. All procedures and experiments are approved by the Institutional Animal Care and Use Committee (IACUC). Our facility is AAALAC-accredited and can be used for biosafety level 1 (ABSL1) and ABSL2 studies. Moreover, the studies can be run as Good Laboratory Practices (GLP), thereby fulfilling the requirements of regulatory agencies for IND packages. Active monitoring post-challenge is performed to ensure the well-being of the animals as well as provide an assessment of the disease activity progression throughout the duration of the experiment. Peripheral blood collection is performed on a regular basis as a means of analyzing the time course of an infection. Execution of specific expected goals is met with superior efficiency in a timely manner while maintaining detailed attention to our animals and data. CD4+ T-cell responses and distribution at the colonic mucosa during Brachyspira hyodysenteriae-induced colitis in pigs. Hontecillas R, Bassaganya-Riera J, Wilson J, Hutto DL, Wannemuehler MJ. Immunology. 2005 May;115(1):127-35. 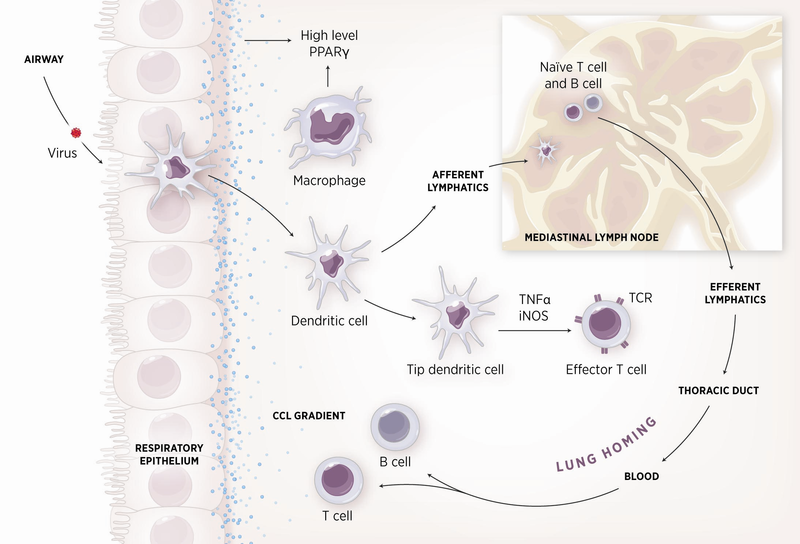 The NIMML has a primary focus on studying the mucosal immune responses to gastrointestinal and respiratory pathogens. Likewise, pre-clinical studies involving infectious disease also provide valuable mechanistic insights on efficacy and safety of vaccines and immune therapeutics. Our projects produce extensive results which can be implemented directly into our modeling efforts for calibration and fitting of model parameters. This approach allows us to begin inferring methods which are more predictive in studying a complex biological system. Risks for infection caused by gastrointestinal pathogens increases for people who travel internationally, live impoverished under malnourished diets, are immunocompromised, or consume the pathogen through contaminated food resulting in a food borne illness. Initial infection usually leads to gastrointestinal discomfort and subsequent diarrhea. When challenged with these pathogens and a persistent chronic illness occurs, painful ulcers form in the gastric (H. pylori) and intestinal tracts due to prolonged inflammation and the necrosis of tissue. Pre-clinical models of these pathogens are vital in the development of therapeutics which will translate into the development human clinical trials. The primary gastrointestinal infectious diseases studied by NIMML under the MIEP program include infections caused by Helicobacter pylori, Clostridium difficile, and Enteroaggregative Escherichia coli (EAEC) although other models can be easily developed. The NIMML is a fully integrated translational effort with capabilities of performing a wide variety of validated immunological assays in pre-clinical and clinical settings as GLP or non-GLP. Experimental variation is tightly controlled through the refinement of protocols for techniques thus generating reliable quality data and our laboratory information management and integration systems. Antigen-specific proliferation of porcine CD8alphaalpha cells to an extracellular bacterial pathogen. Waters WR, Hontecillas R, Sacco RE, Zuckermann FA, Harkins KR, Bassaganya-Riera J, Wannemuehler MJ. Immunology. 2000 Nov;101(3):333-41. Long-term influence of lipid nutrition on the induction of CD8(+) responses to viral or bacterial antigens. Bassaganya-Riera J, Hontecillas R, Zimmerman DR, Wannemuehler MJ. Vaccine. 2002 Jan 31;20(9-10):1435-44. The seasonal flu is a highly contagious illness which affects between 5-20% of people annually in the US. Due to the mutagenic characteristic of the orthomyxovirus, new strains appear each year amounting more than 200,000 hospitalizations due to infection and respiratory complications. The NIMML primarily studies influenza A virus. This genus has the ability to cause detrimental pandemics in a short period of time since it can be transmitted among different species. 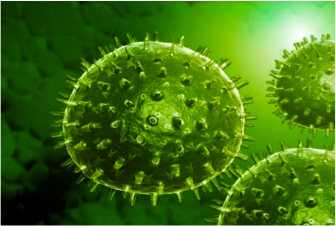 Specific strains in the NIMML include: H1N1 strain A/Pureto Rico/8/34 (PRS), H3N2 strain A/Udorn/72, and the H1N1 strain A/California/07/2009. In addition, the NIMML has received IACUC approval to conduct LD50 studies for influenza projects. Arachidonic acid and docosahexaenoic acid-enriched formulas modulate antigen-specific T cell responses to influenza virus in neonatal piglets. Bassaganya-Riera J, Guri AJ, Noble AM, Reynolds KA, King J, Wood CM, Ashby M, Rai D, Hontecillas R. Am J Clin Nutr. 2007 Mar;85(3):824-36. Impact of immunizations with porcine reproductive and respiratory syndrome virus on lymphoproliferative recall responses of CD8+ T cells. Bassaganya-Riera J, Thacker BJ, Yu S, Strait E, Wannemuehler MJ, Thacker EL. Viral Immunol. 2004;17(1):25-37. The NIMML has the ability to focus on diseases on a multitude of levels. Our projects begin using mouse models and as the data becomes more comprehensive, pigs provide the intermediate step prior to clinical trials. Our pig models have provided data that is critical in understanding the immune response to colitis, IBD, enteric pathogens, and respiratory infections. We continue to use the pig model to facilitate the development of projects which can assist in computational modeling components of the laboratory as well as potentiate the translation of research into human patients. Our streamlined facilities allow us to work with collaborators to collect data and allow for personnel to focus on their specializations. By using students trained in animal sciences and other degrees which provide education encompassing animal models for scientific research, our team is able to work together to make novel advancements in a broad range of scientific topics with efficiency and accuracy. The Nutritional Immunology and Molecular Medicine Laboratory offers a broad array of preclinical services in mouse, rats, hamsters and pigs for product testing, mechanism of action validation studies, and hypothesis–driven and hypothesis-generating in vivo experimentation. All our preclinical animal models are set up in Virginia Tech animal facilities and are approved by the Virginia Tech Institutional Animal Care and Use Committee (IACUC). The mice are housed in a state-of-art facility that can accommodate large projects as well as both animal biosafety level (ABL)-1 and ABL-2 experiments. These services will be provided as a part of a sponsored research agreement with Virginia Tech. The NIMML works in the interface between the experimental and modeling/simulation approaches to study the host responses to gut and respiratory pathogens. The modeling process requires strong crosstalk with the experimental side: model calibration and validation. Each model needs to be calibrated with experimental data to ensure correct fitting and the correct assignment on numerical values for the parameters in differential equations. Afterwards, when the model is fully calibrated with experimental data, a new window to experimental design is opened: model validation. Resulting in model-aided, hypothesis-driven experimental validation, positioning computational modeling as a effective and advanced tool for immunology research and discovery. The NIMML has expertise in developing new designs depending on the needs of the customer. We are currently working in several validation studies for mathematical models under the MIEP program and we are flexible to design new models with creation of knockouts with the zinc finger technology. This validation approach will accelerate the whole process into a final publication, showing how computational method can validate biological processes.